How are Ophiuchus, Serpens Caput, and the Serpent Energy related to one another? Find out here! Ophiuchus is the omitted 13th zodiacal sign. The Mayans placed a great interest in the cosmic serpent, so it seems very peculiar that these two signs are connected, yet never spoken about. Serpens, or the Serpent, is held by the Serpent Holder, Ophiuchus, and is the only constellation to consist of two separate parts – Serpens Caput (the Head) and Serpens Cauda (the Tail). Though the stars of this region have been seen as a serpent for thousands of years, their symbolic meaning remains uncertain. It is thought likely that the Serpent and its bearer Ophiuchus are related to the Greek healer-god Aesclepius. 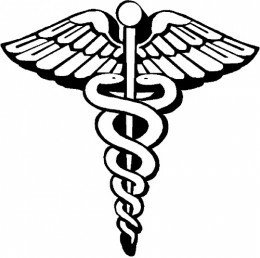 The Greeks believed that the serpents of Asclepius could cure diseases, and so belong a long association between serpents and medicine that continues to our own time. The name translates as the serpent’s neck, though it is sometimes called Cor Serpentis, for the serpent’s heart. Ophiuchus is named by his relationship to the archetypal being called the Serpent. This is the same Serpent that appears in the Garden of Eden story in the bible and also the same Serpent as Quetzalcoatl and Kukulcan, as he is called in Middle America by the Aztecs and the Mayans. Our culture has tended to negate the archetypal energies of the Serpent and associate it with “evil.” The Mayan, Hindu and other indigenous cultures have honored the Serpent and its energy. The Greek mythological version of Ophiuchus tells the story a mortal “lord in waiting” named Aesclepius, the son of the overlord Apollo, and a mortal mother named Coronis who dies in childbirth, who finds the secret of immortality after observing snakes or serpents sharing herbs. Aesclepius, according this Greek tale, was given to the medicine half man Chiron by his father to care for. He grew up learning the crafts of the medicine man. After having discovered the potency of those herbal remedies from the snakes he goes on to use it on other mortals. This doesn’t go well with Zeus who is the grand master of “ruling overlords” and he goes to war with Aesclepius and strikes him down with a thunderbolt. This is a common response from Zeus. But he has some compassion and turns over the constellation of Ophiuchus to the care of Aesclepius. So humanity was once again remain the servants of Zeus the grand master and Aesclepius becomes an immortal. Every year between November 22, and December 25, the Sun passes through the constellation of Ophiuchus, from our perspective here on the Earth. Ophiuchus is that it is the only constellation in human form that resides in the direction of the center of our Milky Way Galaxy. In galactic astrology, the center of the Galaxy is analogous to the Higher Self or the Jungian Self. It is only by transcending the “wheel of twelve” and allowing energy to spiral, resonant with the number thirteen, that we as humans, access and maintain a conscious connection to our Higher Self. The last Age of Ophiuchus was from about 4500 BC to 2500 BC. Now that the Serpent Holder has returned, we have the opportunity to “remember” and once again access ancient wisdom from that time and specifically wisdom related to “serpent energy”. Since the late 1930s, all the planets have astrologically passed through Ophiuchus’ area of the sky. All but one that is. The planet Pluto began its journey through Ophiuchus and the Serpent around the start of the 1990s. This is when the World Wide Web came into existence. 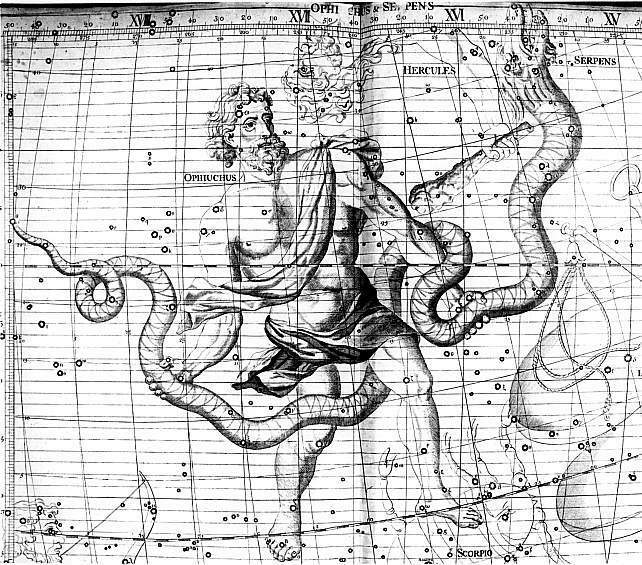 Notice how Ophiuchus is encountering the Serpent through his two hands. Consider how an electric musician, an energy healer and a Web surfer all work with “the energy” through their two hands. Pluto completed its journey through Ophiuchus in 2012. The serpent is not something to fear. When a new religion replaces the previous religion (or school of thought), it often takes something positive and turns it into a negative. We see that in the bible, as the snake is a representation of temptation and evil, which couldn’t be further from the truth! The underlying theme of the biblical snake is telling us not to be tempted by Serpens Caput and its incoming energies. There’s a reason why Ophiuchus is the forgotten constellation and why Serpens Caput’s energy is never spoken about. These magnificent stars help us understand the magnitude of astronomy and how it connects with our everyday lives.